Struggling to get more leads on Twitter? 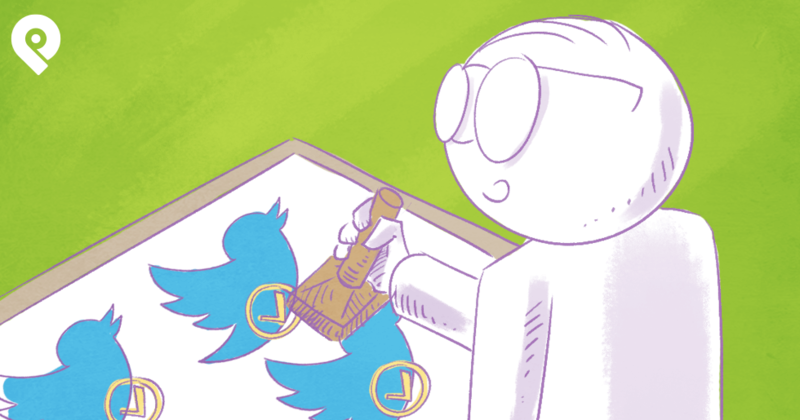 It can be hard to justify your time on Twitter when you aren’t seeing any significant results. But then you hear success stories of businesses who’ve been able to leverage Twitter to get quality leads into their funnel… and you decide to try again. It’s time to figure this out once and for all. 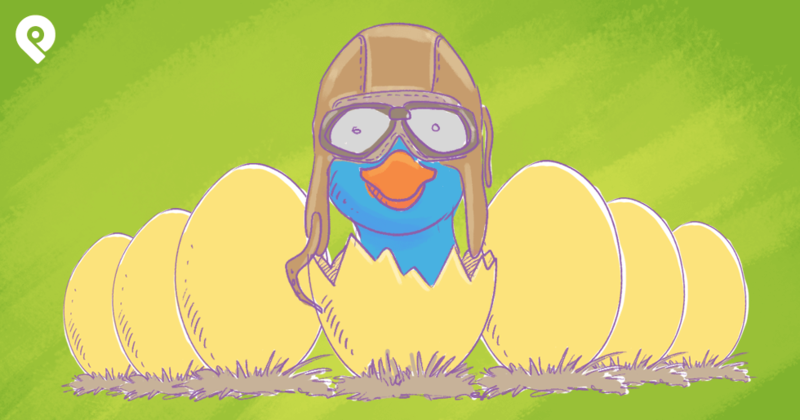 It’s time to get off that roller coaster of uncertainty and finally unlock the key to Twitter lead generation. If you’ve been at it for a while -- you’re probably about to nail it. You just need to make a few tweaks to your strategy. 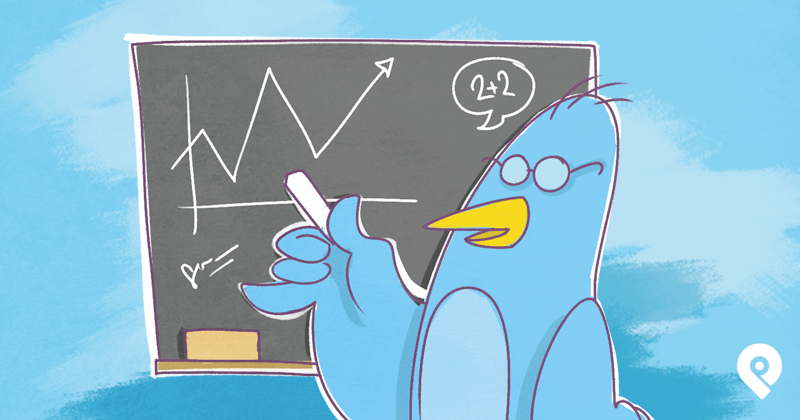 In this post, I'll share 6 advanced strategies to help you get more leads on Twitter. My hope is that after you read this, you’ll be equipped with the knowledge you need to be a more effective Twitter marketer. So many people are clueless about this. I see it in my tweets and DMs every day, and it's almost painful to watch. They don’t understand the Twitter sales process -- so they come off looking like a spammer. There's a fine line on Twitter between promoting and spamming. Your goal is to find that line and walk it like a tight-rope. You’ve got to find that delicate balance. If you jump on Twitter and immediately try to apply traditional sales methods -- you will most likely end up frustrated and convinced that Twitter is a waste of time. Instead, adapt to the Twitter sales process. In order to understand the Twitter sales process, you have to understand how the overall sales process has changed in recent years. I'm going to over simplify it, but you'll get it. Unlike a decade ago, consumers are now in control. They are armed with Twitter, online reviews and recommendations from their peers. They demand more than ever before from businesses, and that means those businesses are held accountable for their products and services. It's forced everyone involved to up their games. Consumers don’t want to be bothered by pushy salespeople. Instead, they want to come to you when they’re ready. Creative salespeople and marketers are able to get more leads on Twitter by being authentic, providing value and creating ways to stand out in the Twitter stream. So how do you show people that you're authentic? You have to build your reputation. That doesn’t happen overnight. You’ve got to connect with your audience and engage with them genuinely. People who don't engage with their followers (yet they spam them with automated DMs) are most likely finding their Twitter marketing efforts falling flat. Here's an example of what NOT to do. 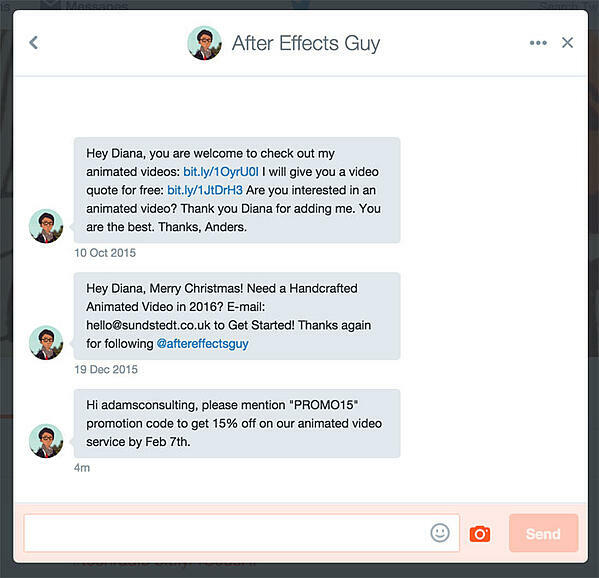 This person has never sent me a tweet to reach out, yet he sure seems excited about selling me an animated video on direct message. The reason this type of Twitter marketing yields terrible results is because not everyone who follows you is a sales lead. Here's a flowchart guide that explains how to identify warm, cold and hot leads on Twitter. There are no shortcuts to building relationships on Twitter. But there are a few things you can do to speed up the process. You can respond to your tweets, participate in relevant Twitter chats and engage with influencers. I recently put together an accelerated 7 Day Twitter Success Plan. It might help you if you want to speed up the process. No matter how you slice it though -- you have to put in the time. Creating an effective Twitter landing page is an art form -- and it’s definitely an advanced strategy. As a sophisticated marketer or social media professional, your goal is to generate leads on Twitter by moving those contacts off Twitter and into your sales funnel. What better way to do that than through a landing page? I know what you’re thinking -- it’s easy said than done. There are tons of free tools that can help you create your own infographics. If you don’t have time to do it yourself, find someone on a site like Fiverr or Freelancer who can do it for you! Keep your landing page SHORT. Twitter is all about being brief -- and that includes the amount of time people will spend reading your landing page. Don’t forget to track how many visitors to your Twitter landing page convert into contacts -- and then ultimately convert into customers. If you find you aren’t seeing the results you want, start A/B testing the elements on the landing page. Here is an example of a tweet I sent on my personal page that leads to one of our landing pages here at Post Planner. This works well for giveaways too! This may sound basic -- but when I show you how this will help you, you’ll see why it’s advanced. Let’s say you own a health and wellness nutrition business, and your goal is to help people get healthy. Think like your potential customers. What might they type into Twitter? Go to the search box on the top right of your profile page and type in what your potential customers might type. I typed in “need to get healthy” -- and look at what I found. There's tons of people who want to get healthy. Drop those people a tweet! Introduce yourself, and follow them. But again, there’s a fine line between being promotional and spamming on Twitter. Send those people a conversational tweet, not a sales-y tweet. And be sure those aren’t the only tweets you’re sending otherwise you’ll look like a spammer when they check out your page. Remember, it’s all about finding the right balance! When this is done correctly, it can be a very effective way to get more leads on Twitter. Just be sure you use the same call to action in each location so you make it easy for your followers to know what the next step is. In this first example, you can see that Donna Moritz uses her Twitter background photo and bio to invite her followers to join her free training (in exchange for their email address of course). In this second example, you can see that Kim Garst uses her CTA in her Twitter background photo combined with a pinned tweet. The good news is you don't have to be a graphic designer to create a kickass Twitter background. I recommend creating your Twitter background right in Canva. 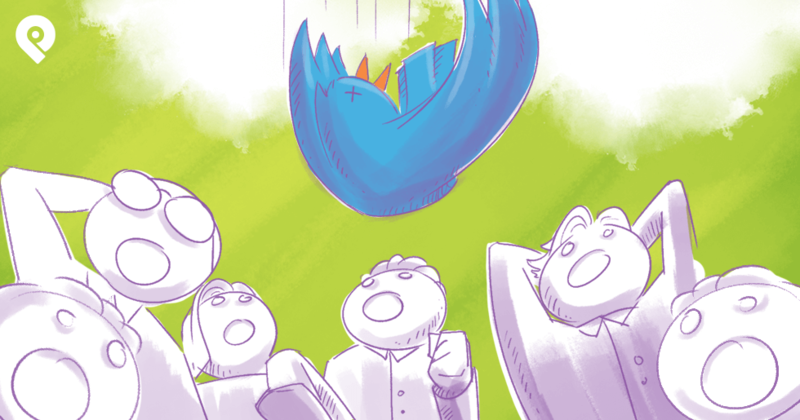 You can check it out on Canva's Twitter Header page. Lead Generation Cards are a great way to get more leads on Twitter. They allow your followers to send their info to you right through the tweet! Click on "Creatives" at the top, then click on "Cards." Follow the prompts to create your Lead Generation Card. Twitter's Lead Generation Cards can be very effective, but there are a lot of moving parts to get right. When someone expands your tweet, they can choose whether or not they want to send you their info. Twitter pre-populates those fields. If they choose to do it, they just click once to send you their name, Twitter handle and email address. Talk about easy! They don't even have to leave the Twitter stream to connect with you. The only downside I see to this is that unless you're using a CRM provider that already has Twitter integration, you'll have to download those contacts from Twitter Ads and manually add them to your CRM. Twitter is currently integrated into Driftrock, Eloqua, ExactTarget, Infusionsoft, LoopFuse, Mailchimp, Marketo, Pardot, Sailthru, Salesforce and Silverpop. According to Dana Tan, you can send an unlimited number of Lead Generation Cards for free by dropping them into a non-promoted tweet. I haven't tried that firsthand, so I can't verify it's still true, but you can read her post about it here on Moz. 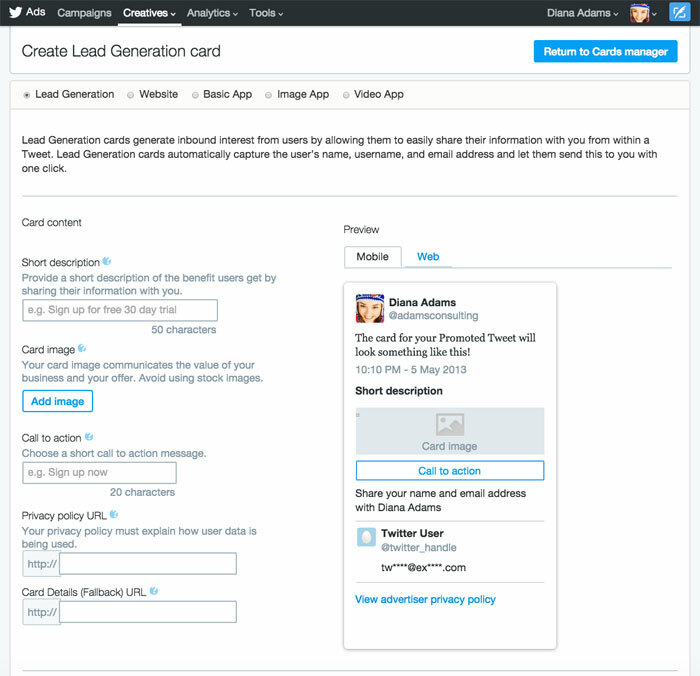 Read about Lead Generation Card best practices here on Twitter. You wear a ton of hats at your business. 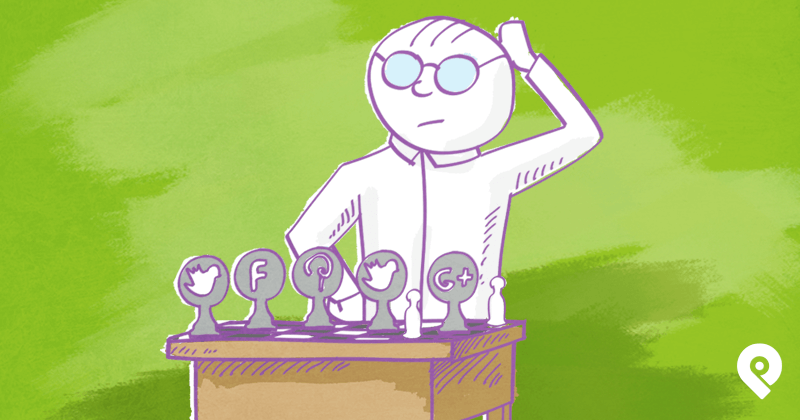 You do marketing, you do sales and now you do social media. You're busy and most likely multitasking your way through each day. It only makes sense that you'd try to optimize your tasks. The last thing you have time to do is put creative energy into your tweets, right? On Twitter, it's all about getting noticed in the stream. The creative tweets always get more engagement. Look at a standard text tweet next to a tweet with rich media. There's no question which tweet will stand out and which tweet will get lost in the stream. Here's an example of a creative tweet that stands out. In this case, it was as simple as recording a 6-second Vine and including that in the tweet. Look at what your competitors are doing on Twitter. How can you do it better? How can you be more creative? If you're good at video -- create Vines for your tweets. If you're good at relationship building -- create the best influencer marketing program ever. If you're good at photography -- share your best branded Instagram photos. If you're good at poetry -- create a haiku in a multi-line tweet (you can read more about those rad multi-line tweets with line breaks here). If you want to get noticed so you can get more leads on Twitter -- you can't tweet the same old stuff day in and day out. Free your mind and get creative. 7. BONUS tip -- watch this! Recently when I was on Blab with @RebekahRadice and @scottayres, we talked about some advanced Twitter strategies that you need to know. We talked about IFFTTT Twitter recipes (omg, so cool! ), Twitter cards, saved searches, tailored trends, viral photos and how to connect with influencers in your local area. The tips in this Blab recap will help you fine-tune your Twitter skills. How to set up your own IFFTTT Twitter recipes to automatically alert you when certain words are mentioned on Twitter, how to add people to your Twitter lists automatically with IFTTT and more. The options with IFFTTT are powerful! How to use Twitter cards (you've probably interacted with one and not realized it). How to use saved searches to make better connections in less time. How to tailor your trends instead of leaving them set on the default setting. How to use viral photos to get more engagement and followers on Twitter. How to connect with Twitter influencers in your town. There's a big pink elephant in the room -- and this is probably a good time to mention it. 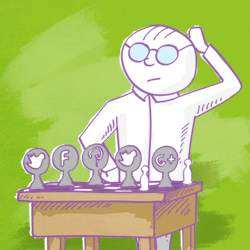 If you want to get more leads on Twitter, you need to get more followers on Twitter. No matter how good your offer is -- if only a handful of people see it, you can't make a big impact. I recommend you start proactively building your followers now. I've organically grown my followers to 133,000 -- and you can too. I shared the plan for how to do it in this recent Twitter post. Become part of the Twitter community. Offer value. Be helpful! Okay, that was technically 3 sentences, but you get the point. Once you do that, the rest of the process will feel more natural. To become part of the Twitter community, you need to send some REALLY valuable tweets and engage with your UH-MAZING peeps. I've sent 160,000 tweets over the years. I know exactly what you're going through. I remember learning so much of this stuff the hard way. But if you put the time into Twitter -- I promise you -- you'll reap the rewards. The people you want to connect with on Twitter want to connect with you. They're looking for you. Consider using the strategies I've shared in this post to find them. Download our infographic below and jumpstart your strategy with 42 things to tweet.